As a child of a writer and journalist and an African woman, I realized very early that I was and am a story teller. I come from a country of very powerful story tellers: Chinua Achebe, Wole Soyinka, Flora Nwapa, Buchi Emecheta and their stories take you on a journey that inspires you to learn about yourself and the world around you. Imagine that? Most importantly, I do believe in the concept that “African storytellers are performers who entertain, inspire, and educate their audience.” So, are artists and designers using story telling as a key tool in their work? 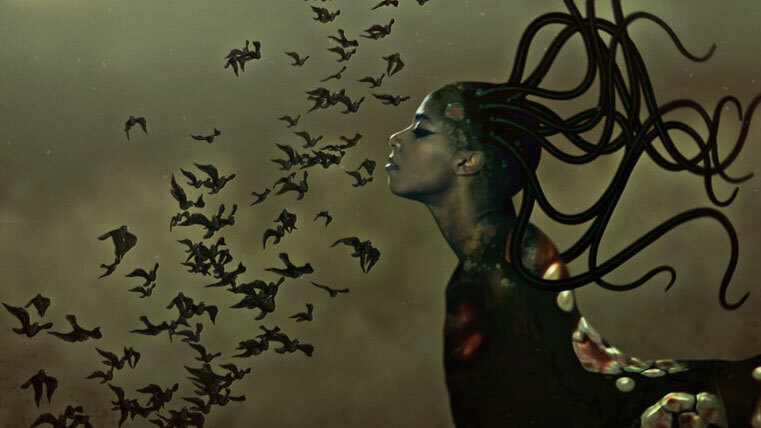 I first met Wangechi Mutu in Tony Whitfield’s office at Parsons School of Design in 2000 when I was his Associate Chair. She came in with Michael Einsminger and spent sometime talking with Tony. She was then a story teller as I listened as she quietly spoke. Today, Mutu’s is on display at the Brooklyn Museum in an exhibition entitled, A Fantastic Journey. And her stories and work as described by the Brooklyn Museum are “spectacular and provocative collages depicting female figures—part human, animal, plant, and machine—in fantastical landscapes that are simultaneously unnerving and alluring, defying easy categorization and identification.” Very definitive and poignant. They are an old and new stories reminding me of African Trickster Tales I grew up with. The museum is in an African story telling mode, again. It’s last exhibition, Gravity and Grace: Monumental Works by El Anatsui, showcased his story telling through his conversion of “found materials into a new type of media that lies between sculpture and painting, combining aesthetic traditions from his birth country, Ghana; his home in Nsukka, Nigeria; and the global history of abstraction”. 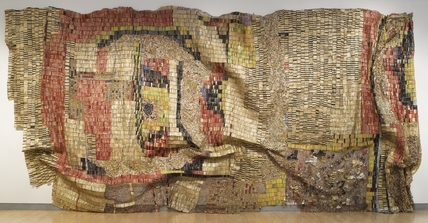 The delicacy of the presentation reveals the story telling of El Anatsui. Simply brilliant. I went to architecture school with J. Max Bond, the eloquent African American story teller and social architect who taught me that architecture is revolution. His stories about designing the Martin Luther King Jr. Center for Nonviolent Social Change, the Birmingham Civil Rights Institute and Schomburg Center for Research in Black Culture resonate in my mind periodically. Max was an African story teller. He weaved his ideas into his design work like a poet. His words showed up on paper and then in building. His last stories were his last two projects: the museum portion of the National September 11 Memorial and Museum at the World Trade Center and the African American History and Culture Museum in Washington DC with David Adjaye, who Max Bond brought in to work on the project. Story telling as African Artists and Designers is a powerful way of working. It symbolizes the power of an idea and execution. Stories must be strong and the art or design work even stronger. So many artists and designers have ideas but fail to embody them in their stories and work. These three artists and designers show what they mean in words and work. The power of an idea, a story, an artwork or design work is as powerful as its producer. What kind of artist or designer are you?